Thanks for printing! Don't forget to come back to Guardian Centers, LLC for fresh articles! Guardian Centers provides the largest, most realistic campus in the world to simulate disasters from weather events to acts of terrorism. Agencies and organiziations can also take advantage of the opportunity to participate in scenarios involving a multi-agency response giving them experience responing to large scale incidents. We offer a wide array of simulations to incorporate into your training or exercise utilizing a commercial downtown environment to include subway trains, highway tunnels, four lane interstate, and city-block sized structural collapse simulators complete with special effects offering unmatched realism. Guardian Centers also provides expert staff to facilitate technical rescue training and exercise. Our instructors, controllers, evaluators, and subject matter experts have the experience and past performance to deliver the best training available. Our state-of-the-art campus provides realistic immersive environments to train and prepare for real world response scenarios. 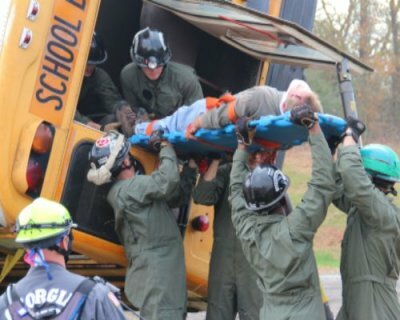 Whether it's role players and moulage, high fidelity mannequins, or advanced trauma training models, Guardian Centers provides the right solutions to meet your requirements. Our key personnel and subject matter experts have the experience and past performance to deliver the best training available. Guardian Centers’ staff were incredibly pro-active. Everything from last minute search dogs to getting specific ethnic/language capable role players and everything in between was taken care of at the right place and right time every time. I’ve seen a lot of sites around the world – this is the most complex site I’ve ever seen. The 830-acre property can recreate just about any disaster scenario imaginable…the diverse disaster scenes are really what makes this place state-of-the-art. When my eyes first saw this, it was a wow factor. Our men and women have been around the proverbial block for many years, but this facility, these types of environments we’re finding here really puts us to work. I’ve seen other training sites around the country; nothing is as extensive or as realistic as Guardian Centers. You will not see a more realistic environment than this anywhere in the world apart from a real incident. We really never had a venue that could allow us to integrate virtually all of that training into a single location…Guardian Centers gets that to a ‘T’. This is the only [facility] that I’ve seen that has all of these venues here on one site. It’s like picking off a menu. You tell them I want this, this being this and this is how I want it done and they make it happen. Everything that we would see in a disaster that we would respond to, they have created here. I think it gives them the best reality that you can find in the country. 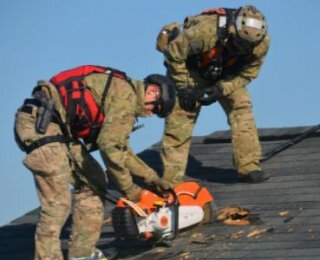 Thanks for providing the dream, facility, and logistical support that resulted in the overwhelming success of exercise Scarlet Response.